Michael McDonald - Otter Productions Inc. | Otter Productions Inc. Michael McDonald - Otter Productions Inc.
Michael McDonald swings by the Central Coast on March 18, 2014 at 8PM at the Performing Arts Center in San Luis Obispo. Advance Reserved tickets will go on sale Friday December 13 at noon at the PAC Box Office, (805) 756-4849, order on line at: www.pacslo.org. 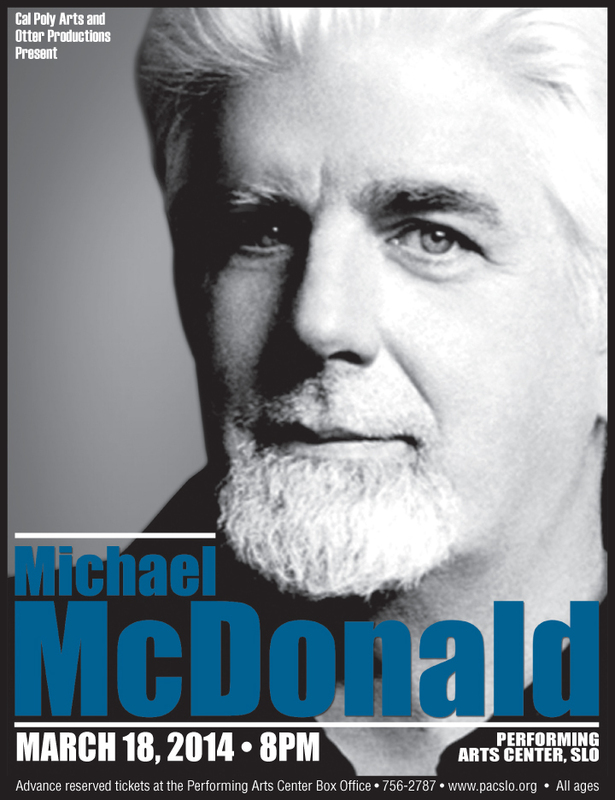 Michael McDonald & Help WhyHunger! Michael is teaming up with WhyHunger on tour to offer fans some of the best seats in the house with a special meet & greet opportunity! VIP Meet & Greet Packages are on sale now exclusively at Tickets-for-Charity.com for select tour dates, with all proceeds benefiting WhyHunger’s work to fight hunger and poverty and to ensure that everyone has access to nutritious food. Michael is a member of WhyHunger’s Artists Against Hunger & Poverty program, which works with musicians, the music community and fans to help raise funds and awareness for the most innovative and effective community-based organizations working to combat hunger and poverty all over the world. Advance Reserved tickets will go on sale Friday December 13 at noon at the Performing Arts Center Box Office, charge by phone at (805) 756-2484 or order on-line at: www.pacslo.org. All Ages Welcome.